The beginning of the year was a time of changes. I finished my fellowship and was about to start my well deserved break, when I volunteered to help with the grant proposal and took on requests for graphical work. So the "break" didn't go exactly as planned, but it convinced to try working as a freelance scientific writer / data visualization designer. In that spirit it was time to revisit the blog. A while ago, I have touched on presenting microscopic images, but that was mostly about using color. Here, I will focus on more basic manipulation such as adjustment of gamma and noise filters. I am sure, that some of you already heard about those manipulations and whether it is an acceptable practice. While I support presenting original data, I also am in favour of actually seeing the data. We're all familiar with speakers saying "it doesn't show very well on the screen, but it looks good on my laptop". Annoying, right? Therefore, I stand on the position that it's better to crank the contrast, play a bit with the gamma settings and allow the audience to appreciate our work. That being said, any quantitative analysis should be done on raw images, and if you manipulate images always disclose it to your audience! Let's take an example. This image shows CFP labeled mitochondria in part of a neuronal arbor. Note: I use PhotoShop, as it allows to structure a file in a way that it is easy to go back and make changes later on, as well as link files directly to Illustrator, a handy feature when it comes to making figures. It's all just black. 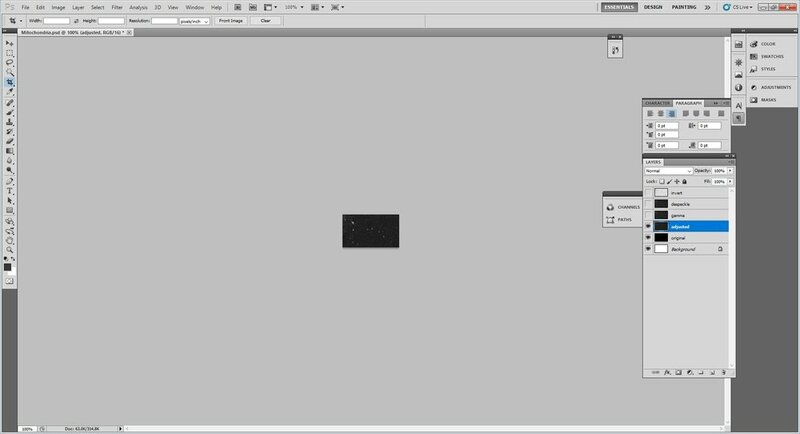 This is completely understandable when you know that image was acquired as an 12-bit and PhotoShop opens it as 16-bit. The first thing to do is to adjust the look up table (LUT). So this is where we enter the possibilities of manipulation. I start with adjusting gamma. For those of you not familiar with what gamma does: it changes the progression of signal intensity from linear to non-linear. In simpler terms it increases the contrast between dark and bright objects. You can read more about it here and here. That already looks pretty good and you could probably stop here. But I would like to briefly mention noise filters. There is a variety of those and they work in different fashion (check imageJ documentation). What the filter does, is it blurs the background and sharpens the edges between bright and dark areas; read more here. In this particular example, despeckle filter was not really necessary, but I wanted to show you that it is an option when manipulating an image. 4) while manipulations are acceptable there is a possibility of overdoing it. Use it only to bring up the signal you can see without manipulation (having in mind the quality of the screen or printout), not to create new signals or remove the existing ones - good background is a bit noisy, not completely black!